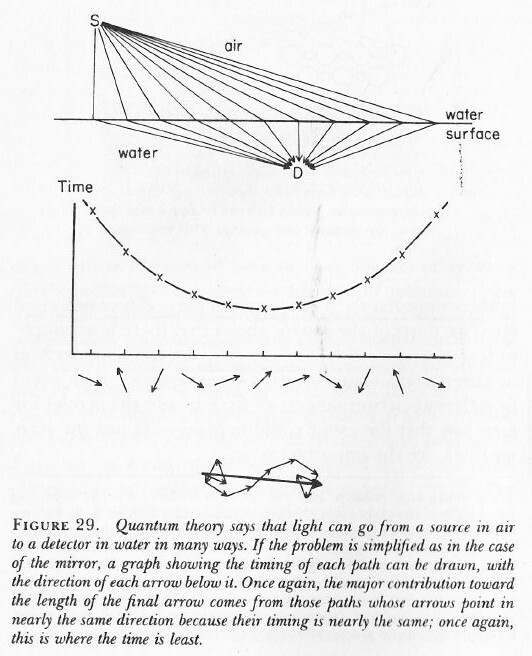 In my previous post, I discussed the de Broglie wave of a photon. It’s usually referred to as ‘the’ wave function (or the psi function) but, as I explained, for every psi – i.e. the position-space wave function Ψ(x ,t) – there is also a phi – i.e. the momentum-space wave function Φ(p, t). In that post, I also compared it – without much formalism – to the de Broglie wave of ‘matter particles’. Indeed, in physics, we look at ‘stuff’ as being made of particles and, while the taxonomy of the particle zoo of the Standard Model of physics is rather complicated, one ‘taxonomic’ principle stands out: particles are either matter particles (known as fermions) or force carriers (known as bosons). It’s a strict separation: either/or. No split personalities. Wikipedia’s overview of particles in the Standard Model (including the latest addition: the Higgs boson) illustrates this fundamental dichotomy in nature: we have the matter particles (quarks and leptons) on one side, and the bosons (i.e. the force carriers) on the other side. Don’t be put off by my remark on the particle zoo: it’s a term coined in the 1960s, when the situation was quite confusing indeed (like more than 400 ‘particles’). However, the picture is quite orderly now. In fact, the Standard Model put an end to the discovery of ‘new’ particles, and it’s been stable since the 1970s, as experiments confirmed the reality of quarks. Indeed, all resistance to Gell-Man’s quarks and his flavor and color concepts – which are just words to describe new types of ‘charge’ – similar to electric charge but with more variety), ended when experiments by Stanford’s Linear Accelerator Laboratory (SLAC) in November 1974 confirmed the existence of the (second-generation and, hence, heavy and unstable) ‘charm’ quark (again, the names suggest some frivolity but it’s serious physical research). Also note that the particle zoo is actually less complicated than it looks at first sight: the (composite) particles that are stable in our world – this world – consist of three quarks only: a proton consists of two up quarks and one down quark and, hence, is written as uud., and a neutron is two down quarks and one up quark: udd. Hence, for all practical purposes (i.e. for our discussion how light interacts with matter), only the so-called first generation of matter-particles – so that’s the first column in the overview above – are relevant. As for the (first-generation) neutrino in the table – the only one which you may not be familiar with – these are very spooky things but – I don’t want to scare you – relatively high-energy neutrinos are going through your and my my body, right now and here, at a rate of some hundred trillion per second. They are produced by stars (stars are huge nuclear fusion reactors, remember? ), and also as a by-product of these high-energy collisions in particle accelerators of course. But they are very hard to detect: the first trace of their existence was found in 1956 only – 26 years after their existence had been postulated: the fact that Wolfgang Pauli proposed their existence in 1930 to explain how beta decay could conserve energy, momentum and spin (angular momentum) demonstrates not only the genius but also the confidence of these early theoretical quantum physicists. Most neutrinos passing through Earth are produced by our Sun. Now they are being analyzed more routinely. The largest neutrino detector on Earth is called IceCube. It sits on the South Pole – or under it, as it’s suspended under the Antarctic ice, and it regularly captures high-energy neutrinos in the range of 1 to 10 TeV. 1. Of all of the bosons, the photon (i.e. the topic of this post), is the most straightforward: there is only type of photon, even if it comes in different possible states of polarization. I should probably do a quick note on polarization here – even if all of the stuff that follows will make abstraction of it. Indeed, the discussion on photons that follows (largely adapted from Feynman’s 1985 Lectures on Quantum Electrodynamics) assumes that there is no such thing as polarization – because it would make everything even more complicated. The concept of polarization (linear, circular or elliptical) has a direct physical interpretation in classical mechanics (i.e. light as an electromagnetic wave). In quantum mechanics, however, polarization becomes a so-called qubit (quantum bit): leaving aside so-called virtual photons (these are short-range disturbances going between a proton and an electron in an atom – effectively mediating the electromagnetic force between them), the property of polarization comes in two basis states (0 and 1, or left and right), but these two basis states can be superposed. In ket notation: if ¦0〉 and ¦1〉 are the basis states, then any linear combination α·¦0〉 + ß·¦1〉 is also a valid state provided│α│2 + │β│2 = 1, in line with the need to get probabilities that add up to one. In case you wonder why I am introducing these kets, there is no reason for it, except that I will be introducing some other tools in this post – such as Feynman diagrams – and so that’s all. In order to wrap this up, I need to note that kets are used in conjunction with bras. So we have a bra-ket notation: the ket gives the starting condition, and the bra – denoted as 〈 ¦ – gives the final condition. They are combined in statements such as 〈 particle arrives at x¦particle leaves from s〉 or – in short – 〈 x¦s〉 and, while x and s would have some real-number value, 〈 x¦s〉 would denote the (complex-valued) probability amplitude associated wit the event consisting of these two conditions (i.e the starting and final condition). 2. Gluons, the exchange particles for the strong force, are more complicated: they come in eight so-called colors. In practice, one should think of these colors as different charges, but so we have more elementary charges in this case than just plus or minus one (±1) – as we have for the electric charge. So it’s just another type of qubit in quantum mechanics. 3. Z and W bosons carry the so-called weak force, aka as Fermi’s interaction: they explain how one type of quark can change into another, thereby explaining phenomena such as beta decay. Beta decay explains why carbon-14 will, after a very long time (as compared to the ‘unstable’ particles mentioned above), spontaneously decay into nitrogen-14. Indeed, carbon-12 is the (very) stable isotope, while carbon-14 has a life-time of 5,730 ± 40 years ‘only’ (so one can’t call carbon-12 ‘unstable’: perhaps ‘less stable’ will do) and, hence, measuring how much carbon-14 is left in some organic substance allows us to date it (that’s what (radio)carbon-dating is about). As for the name, a beta particle can refer to an electron or a positron, so we can have β– decay (e.g. the above-mentioned carbon-14 decay) as well as β+ decay (e.g. magnesium-23 into sodium-23). There’s also alpha and gamma decay but that involves different things. As you can see from the table, W± and Z0 bosons are very heavy (157,000 and 178,000 times heavier than a electron! ), and W± carry the (positive or negative) electric charge. So why don’t we see them? Well… They are so short-lived that we can only see a tiny decay width, just a very tiny little trace, so they resemble resonances in experiments. That’s also the reason why we see little or nothing of the weak force in real-life: the force-carrying particles mediating this force don’t get anywhere. 4. Finally, as mentioned above, the Higgs particle – and, hence, of the associated Higgs field – had been predicted since 1964 already but its existence was only (tentatively) experimentally confirmed last year. The Higgs field gives fermions, and also the W and Z bosons, mass (but not photons and gluons), and – as mentioned above – that’s why the weak force has such short range as compared to the electromagnetic and strong forces. Note, however, that the Higgs particle does actually not explain the gravitational force, so it’s not the (theoretical) graviton and there is no quantum field theory for the gravitational force as yet. Just Google it and you’ll quickly find out why: there’s theoretical as well as practical (experimental) reasons for that. The Higgs field stands out from the other force fields because it’s a scalar field (as opposed to a vector field). 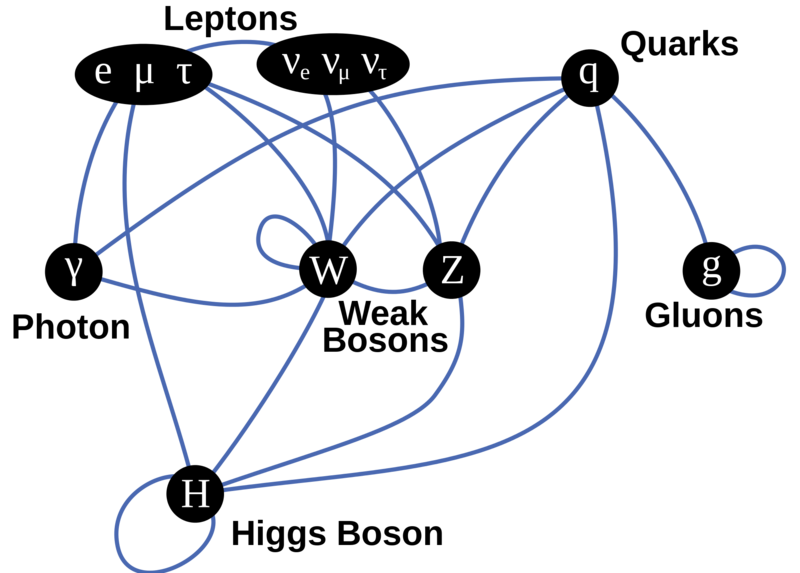 However, I have no idea how this so-called Higgs mechanism (i.e. the interaction with matter particles (i.e. with the quarks and leptons, but not directly with neutrinos it would seem from the diagram below), with W and Z bosons, and with itself – but not with the massless photons and gluons) actually works. But then I still have a very long way to go on this Road to Reality. In any case… The topic of this post is to discuss light and its interaction with matter – not the weak or strong force, nor the Higgs field. If we want to do that, then we will need to square the modulus of the corresponding wave function Ψ(x, t). To be precise, we will have to do a summation of all the values │Ψ(x, t)│2 over the interval and, because x and t are real (and, hence, continuous) numbers, that means doing some integral (because an integral is the continuous version of a sum). But that’s only one example of an observable property: position. There are others. For example, we may not be interested in the particle’s exact position but only in its momentum or energy. Well, we have another wave function for that: the momentum wave function Φ(x ,t). In fact, if you looked at my previous posts, you’ll remember the two are related because they are conjugate variables: Fourier transforms duals of one another. A less formal way of expressing that is to refer to the uncertainty principle. But this is not the time to repeat things. The bottom line is that all particles travel through spacetime with a backpack full of complex-valued wave functions. We don’t know who and where these particles are exactly, and so we can’t talk to them – but we can e-mail God and He’ll send us the wave function that we need to calculate some probability we are interested in because we want to check – in all kinds of experiments designed to fool them – if it matches with reality. As mentioned above, I highlighted the main difference between bosons and fermions in my Bose and Fermi post, so I won’t repeat that here. Just note that, when it comes to working with those probability amplitudes (that’s just another word for these psi and phi functions), it makes a huge difference: fermions and bosons interact very differently. Bosons are party particles: they like to crowd and will always welcome an extra one. Fermions, on the other hand, will exclude each other: that’s why there’s something referred to as the Fermi exclusion principle in quantum mechanics. That’s why fermions make matter (matter needs space) and bosons are force carriers (they’ll just call friends to help when the load gets heavier). OK. Let’s get down to business. This post is about light, or about light-matter interaction. Indeed, in my previous post (on Light), I promised to say something about the amplitude of a photon to go from point A to B (because – as I wrote in my previous post – that’s more ‘relevant’, when it comes to explaining stuff, than the amplitude of a photon to actually be at point x at time t), and so that’s what I will do now. Well… Thank you, Mr Feynman: I’ve always wanted to understand the World (especially if you made it). Let’s start with the last of those three amplitudes (or wave functions): the amplitude of an electron to absorb or emit a photon. Indeed, absorbing or emitting makes no difference: we have the same complex number for both. It’s a constant – denoted by j (for junction number) – equal to –0.1 (a bit less actually but it’s good enough as an approximation in the context of this blog). Huh? Minus 0.1? That’s not a complex number, is it? It is. Real numbers are complex numbers too: –0.1 is 0.1eiπ in polar coordinates. As Feynman puts it: it’s “a shrink to about one-tenth, and half a turn.” The ‘shrink’ is the 0.1 magnitude of this vector (or arrow), and the ‘half-turn’ is the angle of π (i.e. 180 degrees). He obviously refers to multiplying (no adding here) j with other amplitudes, e.g. P(A, C) and E(B, C) if the coupling is to happen at or near C. And, as you’ll remember, multiplying complex numbers amounts to adding their phases, and multiplying their modulus (so that’s adding the angles and multiplying lengths). More importantly, a Feynman diagram is a pictorial device showing what needs to be calculated and how. Indeed, with all the complexities involved, it is easy to lose track of what should be added and what should be multiplied, especially when it comes to much more complicated situations like the one described above (e.g. making sense of a scattering event). So, while the coupling constant j (aka as the ‘charge’ of a particle – but it’s obviously not the electric charge) is just a number, calculating an actual E(A to B) amplitudes is not easy – not only because there are many different possible routes (paths) but because (almost) anything can happen. Let’s have a closer look at it. Fortunately, the calculation re-uses known values: the amplitude for each ‘hop’ – from C to D, for example – is P(F to G) – so that’s the amplitude of a photon (!) to go from F to G – even if we are talking an electron here. But there’s a difference: we also have to multiply the amplitudes for each ‘hop’ with the amplitude for each ‘stop’, and that’s represented by another number – not j but n2. So we have an infinite series of terms for E(A to B): P(A to B) + P(A to C)·n2·P(C to B) + P(A to D)·n2·P(D to E)·n2·P(E to B) + … for all possible intermediate points C, D, E, and so on, as per the illustration below. You’ll immediately ask: what’s the value of n? It’s quite important to know it, because we want to know how big these n2, n4 etcetera terms are. I’ll be honest: I have not come to terms with that yet. 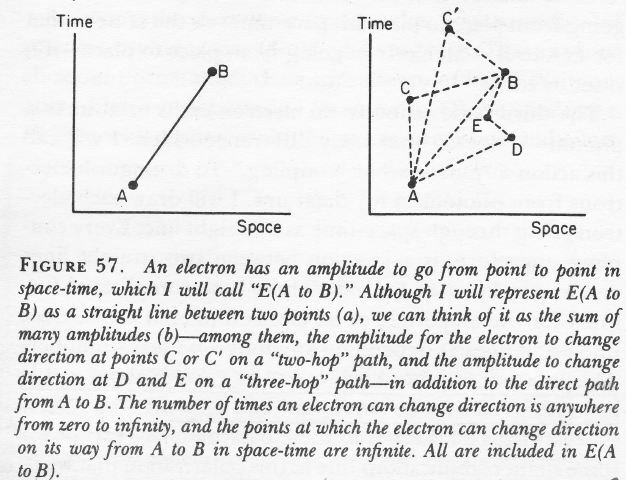 According to Feynman (QED, p. 125), it is the ‘rest mass’ of an ‘ideal’ electron: an ‘ideal’ electron is an electron that doesn’t know Feynman’s amplitude theory and just goes from point to point in spacetime using only the direct path. 🙂 Hence, it’s not a probability amplitude like j: a proper probability amplitude will always have a modulus less than 1, and so when we see exponential terms like j2, j4,… we know we should not be all that worried – because these sort of vanish (go to zero) for sufficiently large exponents. For E(A to B), we do not have such vanishing terms. I will not dwell on this right here, but I promise to discuss it in the Post Scriptum of this post. The frightening possibility is that n might be a number larger than one. Regardless of the value for n, it’s obvious we need a functional form for P(A to B), because that’s the other thing (other than n) that we need to calculate E(A to B). So what’s the amplitude of a photon to go from point A to B? For time-like intervals, we have a negative value for I, so Δt2 > Δr2. For two events separated by a time-like interval, enough time passes between them so there could be a cause–effect relationship between the two events. In a Feynman diagram, the angle between the time axis and the line between the two events will be less than 45 degrees from the vertical axis. The traveling electrons in the Feynman diagrams above are an example. For space-like intervals, we have a positive value for I, so Δt2 < Δr2. Events separated by space-like intervals cannot possibly be causally connected. 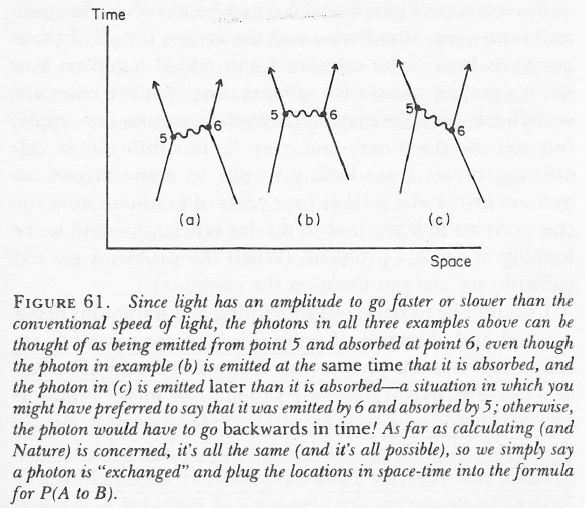 The photons traveling between point 5 and 6 in the first Feynman diagram are an example, but then photons do have amplitudes to travel faster than light. Finally, for light-like intervals, I = 0, or Δt2 = Δr2. The points connected by the 45-degree lines in the illustration below (which Feynman uses to introduce his Feynman diagrams) are an example of points connected by light-like intervals. Now, what’s the relevance of this? 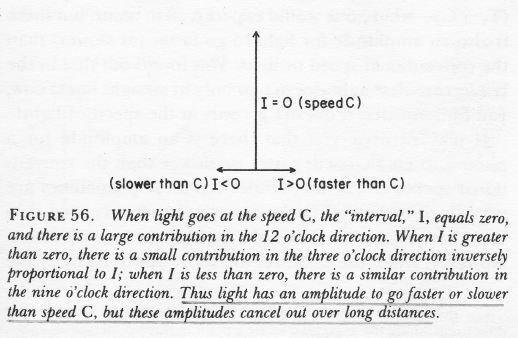 To calculate P(A to B), we have to add the amplitudes for all possible paths that the photon can take, and not in space, but in spacetime. So we should add all these vectors (or ‘arrows’ as Feynman calls them) – an infinite number of them really. In the meanwhile, you know it amounts to adding complex numbers, and that infinite sums are done by doing integrals, but let’s take a step back: how are vectors added? Well…That’s easy, you’ll say… It’s the parallelogram rule… Well… Yes. And no. Let me take a step back here to show how adding a whole range of similar amplitudes works. When these stopwatches hit the retina of our poor fish’s eye (I feel we should put a detector there, instead of a fish), they will stop, and the hand of each stopwatch represents an amplitude: it has a modulus (its length) – which is assumed to be the same because all paths are equally likely (this is one of the first principles of QED) – but their direction is very different. However, by now we are quite familiar with these operations: we add all the ‘arrows’ indeed (or vectors or amplitudes or complex numbers or whatever you want to call them) and get one big final arrow, shown at the bottom – just above the caption. Look at it very carefully. If you look at the so-called contribution made by each of the individual arrows, you can see that it’s the arrows associated with the path of least time and the paths immediately left and right of it that make the biggest contribution to the final arrow. Why? Because these stopwatches arrive around the same time and, hence, their hands point more or less in the same direction. It doesn’t matter what direction – as long as it’s more or less the same. So, where are we? This digressions go on and on, don’t they? Let’s go back to the main story: we want to calculate P(A to B), remember? 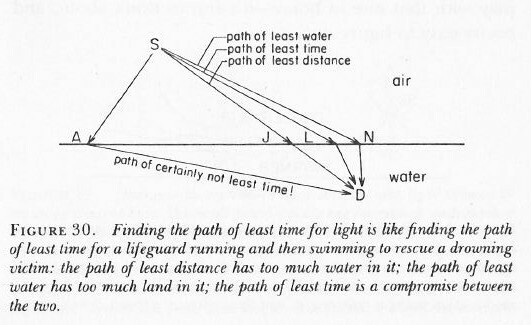 As mentioned above, one of the first principles in QED is that all paths – in spacetime – are equally likely. So we need to add amplitudes for every possible path in spacetime using that Feynman propagator function. You can imagine that will be some kind of integral which you’ll never want to solve. Fortunately, Feynman’s disciples have done that for you already. The results is quite predictable: the grand result is that light has a tendency to travel in straight lines and at the speed of light. WHAT!? Did Feynman get a Nobel prize for trivial stuff like that? Yes. The math involved in adding amplitudes over all possible paths not only in space but also in time uses the so-called path integral formulation of quantum mechanics and so that’s got Feynman’s signature on it, and that’s the main reason why he got this award – together with Julian Schwinger and Sin-Itiro Tomonaga: both much less well known than Feynman, but so they shared the burden. Don’t complain about it. Just take a look at the ‘mechanics’ of it. So what remains to be told? Lots of things, even within the realm of expertise of quantum electrodynamics. Indeed, Feynman applies the basics as described above to a number of real-life phenomena – quite interesting, all of it ! – but, once again, it’s not my goal to copy all of his Lectures here. [I am only hoping to offer some good summaries of key points in some attempt to convince myself that I am getting some of it at least.] And then there is the strong force, and the weak force, and the Higgs field, and so and so on. But that’s all very strange and new territory which I haven’t even started to explore. I’ll keep you posted as I am making my way towards it. In this post, I promised I would write something about how we can find j and n because I realize it would just amount to copy three of four pages out of that book I mentioned above, and which inspired most of this post. Let me just say something more about that remarkable book, and then quote a few lines on what the author of that book – the great Mr Feynman ! – thinks of the math behind calculating these two constants (the coupling constant j, and the ‘rest mass’ of an ‘ideal’ electron). Now, before I do that, I should repeat that he actually invented that math (it makes use of a mathematical approximation method called perturbation theory) and that he got a Nobel Prize for it. That’s a pretty damning statement, isn’t it? In one of my other posts (see: The End of the Road to Reality? ), I explore these comments a bit. However, I have to admit I feel I really need to get back to math in order to appreciate these remarks. I’ve written way too much about physics anyway now (as opposed to the my first dozen of posts – which were much more math-oriented). So I’ll just have a look at some more stuff indeed (such as perturbation theory), and then I’ll get back blogging. Indeed, I’ve written like 20 posts or so in a few months only – so I guess I should shut up for while now ! In the meanwhile, you’re more than welcome to comment of course !